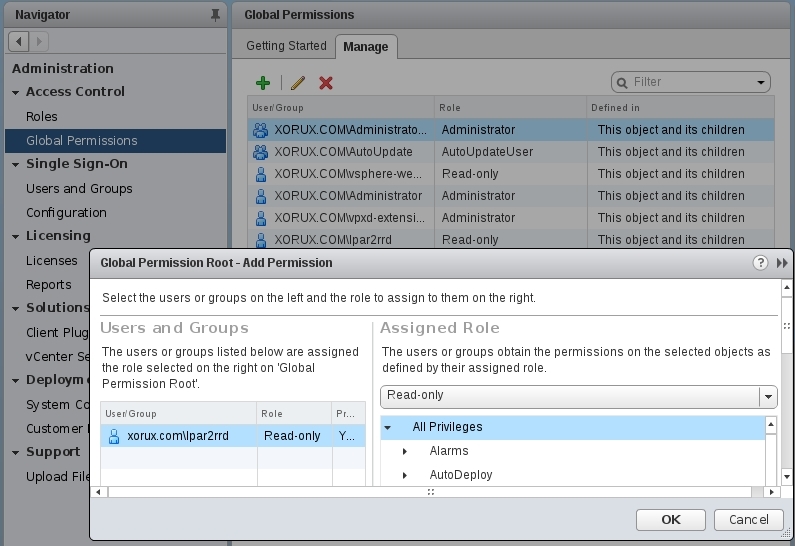 Create a user on each vCenter with read-only role. Download Linux VMware Perl SDK in tar.gz format from VMware site. It requires free registration at VMware. You can use this method only on the Virtual Appliance. Select previously downloaded Linux VMware Perl SDK, and upload it. $PERL vmware-lib/apps/connect.pl --server <vCenter host> --username "lpar2rrd@your_domain" --password "XXXXX"
Server version unavailable at 'https://<vCenter host>:443/sdk/vimService.wsdl' at /home/lpar2rrd/lpar2rrd/vmware-lib/apps/../VMware/VICommon.pm line 704. Test vCenter connection via "Test" button. When you use Virtual Appliance then use "run data load" button and wait a bit. Your vcenter appears in a few minutes after Ctrl-F5 (browser refresh). That is all! 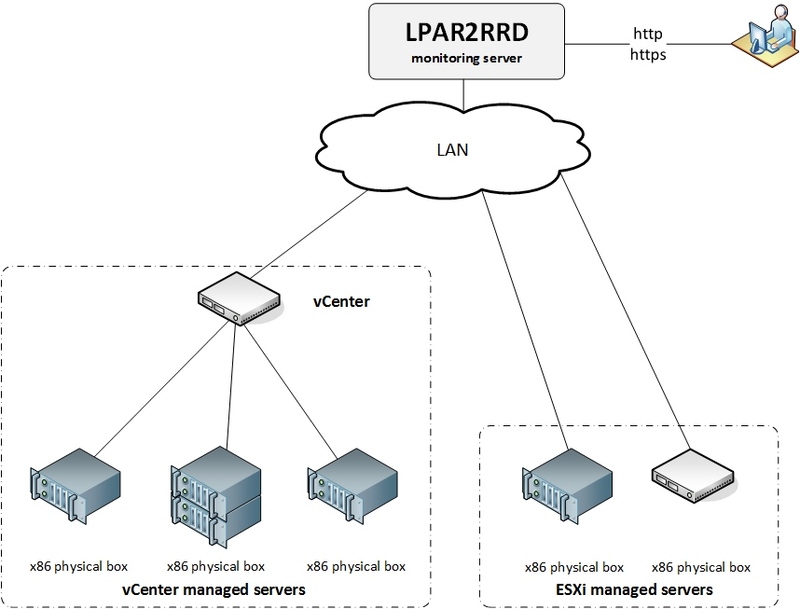 $PERL vmware-lib/apps/connect.pl --server <server name> --username "lpar2rrd"
Server version unavailable at 'https://vcenter01:443/sdk/vimService.wsdl' at /lpar2rrd/lpar2rrd/vmware-lib/apps/..//VMware/VICommon.pm line 734. The reason is that user you have configured for retrieving data from the vCenter probably has not read access to whole vCenter and it cannot access all required perf counters. Consult user rights setup with your vCenter administrator. You should get the same answer with no password request. 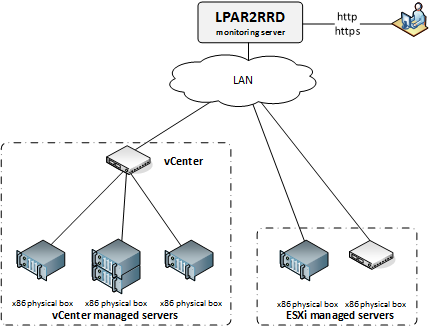 Use the same hostname and username as defined in LPAR2RRD VMware Configuration. OS agent is add-on feature for monitoring from operating system level. It is monitoring CPU, memory utilization, paging, LAN and SAN traffic on all adapters. It requires the OS agent deployment to every monitored VM. The agent is written in Perl and calls basic OS commands to obtain required statistics like vmstat, iostat. Features supported by the OS agent. Opened TCP communication between each VM and LPAR2RRD server on port 8162. Connections are initiated from VM side. Schedule its run every minute from the crontab on every VM. Replace <LPAR2RRD-SERVER> by hostname of your LPAR2RRD server. You might need to add lpar2rrd user into /var/adm/cron/cron.allow under root user if above "crontab -e" fails. Test if communication through the LAN is allowed. This is ok, exit either Ctrl-C or ^]. It means that the agent could not contact the server. Check communication, port, above telnet example, DNS resolution of the server etc. 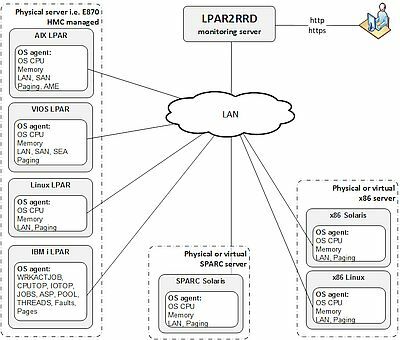 In case of a problem check our forum or contact us via support@lpar2rrd.com. We would need this data for start of troubleshooting. 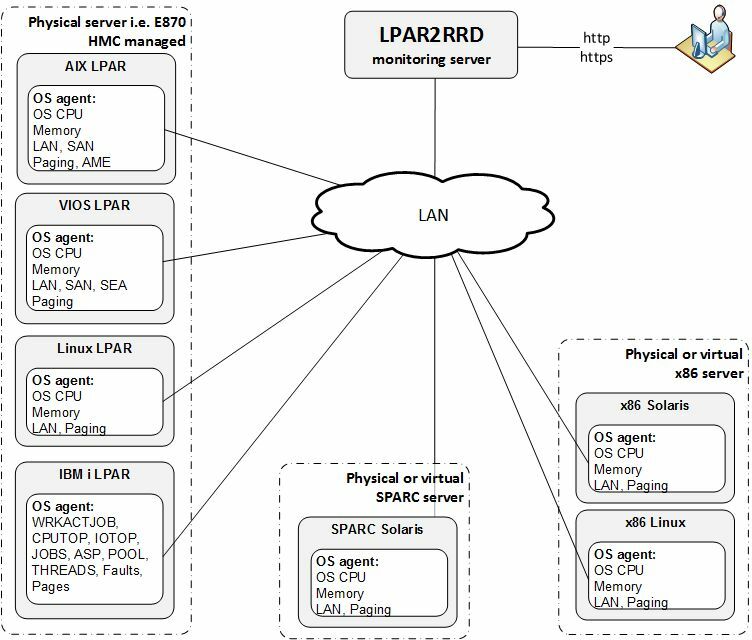 LPAR2RRD agent is available since 3.56 release. You will not need to upgrade LPAR2RRD agents regularly with each LPAR2RRD upgrade. Read release notes if that is necessary. Check OS agent upgrade steps.